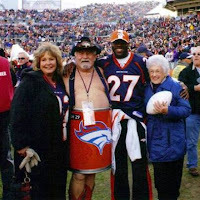 Jeff Clark, who has been a fan of the Denver Broncos since 1984, has started an online petition to team owner and CEO Pat Bowlen to induct super fan Tim "The Barrel Man" McKernan into the club's Ring of Fame. "I grew up watching the Barrel Man represent the fans for all those years. I was fortunate enough to meet him in person at training camp and he was as genuine as they come," Clark said on Friday afternoon. As of Sunday afternoon, the petition has just over 700 signatures. Clark has also set up a website with the help of fellow fan Rick Long to promote the petition at www.barrelman2rof.info. "I have become friends with Tim's wife Becky via Facebook and I wanted to do something to see if the Broncos would honor him. I asked Becky and she gave her blessing, so I'm trying to get the ball rolling," said Clark. Two years ago, fans started an online petition for the team to return to orange jerseys. After gaining over 10,000 signatures and drawing the attention of the team, the Broncos made the uniform switch. Clark is hoping for similar success. "I think both Mr. Bowlen and John Elway are very responsive to the fans and if there is enough support it could happen. Both men know firsthand Barrel Man's contributions as an ambassador for the team and our fans," concluded Clark. In 1999, McKernan was inducted into the NFL's Hall of Fans section of the Hall of Fame in Canton, Ohio. McKernan passed away in 2009 but has not been forgotten by the team or fellow fans. To help get him into the Ring of Fame, you can sign the petition here.